Can Kush maintain their reputation for fine-sounding analogue gear with this interesting EQ? New York-based Kush Audio’s chief designer Gregory Scott has developed a number of signal processors in recent years. 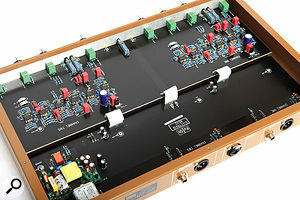 Kush’s story began with a redesign of the Empirical Labs Fatso processor, and their recent products include the forward-thinking Clariphonic parallel EQ. Today, the company offer a small but interestingly diverse range of analogue audio tools including the units I’ve just mentioned, a modular monitor controller system, and a couple of well-received software plug-ins. They’re now widely regarded as manufacturers who combine the good aspects of well-proven designs with fresh ideas. Whereas the Clariphonic EQ trod uncharted territory (see Sound On Sound’s September 2011 review for more on this: http://sosm.ag/sep11-kush-clariphonic), Kush’s latest EQ, the Electra, is a little more down-to-earth. Yet while Scott has understandably seen no need to reinvent the metaphorical wheel of filter technology, the Electra does present its flexible feature set with a few unique twists. The Electra’s 1U rackmount enclosure provides sufficient space to accommodate a two-channel EQ with five separate bands on each channel. However, whereas most EQs implement the same principles in each individual band, the Electra’s five bands employ a total of four different filter topologies. The two semi-parametric bands cover a much wider frequency range than is typical — from 30-730 and 250-5300 Hz, respectively — and their ranges overlap generously, which means that together they can control a whole lot of ground, from staggeringly low TR808 bass-drum fundamentals all the way up to the presence range, to make a voice cut through a dense mix. 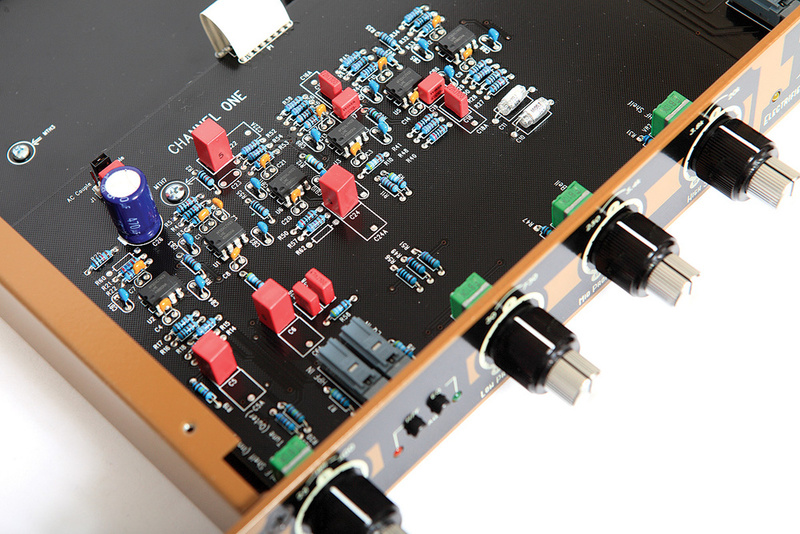 As proportional-Q designs, in the vein of API’s classic 550a, these bands feature only frequency and gain controls, and their bandwidth automatically adjusts with changes in amplitude. The bandwidth stays broad at lower gain settings, and it becomes increasingly narrow with higher boosts or cuts. Such an EQ design is easy to use, and it provides extremely ‘musical’ results, both when accentuating wider frequency ranges or when honing in on a problematic resonance. Each side of the Electra EQ offers four dual concentric potentiometers controlling no fewer than five individual filter bands. The mid-band design also provided inspiration for this EQ’s name. Electra is short for ‘Electrified Transient Equalizer’, a term which suggests the use of dynamic EQ or some other functionality operating in the time as well as the frequency domain, but according to the designer, thetruth is much simpler. Scott says that the name refers to the way the typical shape of the mid-bands, with its rather wide skirt and the narrow top of the bell, allows the user to control signals and to bring out dynamically interesting structures in the source material. The Electra’s top end is rounded off by a flexible shelving filter. It spans an unusually wide range, with continuously adjustable corner frequencies from 3.8 right up to 20 kHz and, in contrast to most other high shelving filters with their wide and gentle curves, offers a rather steep slope, especially at higher frequency settings. Both options have their own strengths, but the huge advantage of this design is that you can boost the ‘expensive’-sounding air band without aggravating any potentially aggressive-sounding high-mids. There’s also a shelving filter for the low frequencies, which comes with a minimum of controls, for ease of use. It has a very gentle Baxandall curve that affects the mid-range around 1-2 kHz and then gradually becomes more powerful, until it reaches its full boost or attenuation at around 90Hz. This should be a great means to gently but effectively warm up or thin out any source; in other words, all the body and the weight of any programme material may be defined with just this single filter band. Last, but not least, each Electra channel boasts a Butterworth high-pass filter, fully sweepable between 25 and 400 Hz, with a 12dB/octave slope and a slight resonance peak around the corner frequency. The beauty of this is that it not only cleans up unwanted infrasonic rumble, but can also accentuate the fundamental frequency of the bass drum at the same time, for even more clarity and sonic impact. 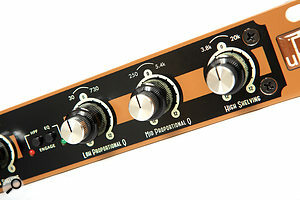 Both the high-pass and the EQ sections come with their own LED-lit bypass knobs. No matter how you look at it, then, the Electra EQ offers ample frequency-shaping options in a compact package. The front-panel controls are well laid out, allowing for easy use, and Kush’s familiar yet striking Art Deco design makes the whole thing look like something from Batman’s Gotham City — which is quite fitting for a New York-based manufacturer! The circuit layout under the lid is also as clean as it could be. The manufacturing is based on a truly With combi XLR/TRS sockets for the inputs and separate XLRs and TRS jacks for the outputs, the Electra is well suited for connecting to external equipment. modern approach: apart from three ribbon cables connecting the two large PCBs there’s no cabling, with all connections made via the traces on the PCBs. It’s an approach which makes manufacturing easier, and helps to keep the costs as low as possible. The actual audio circuit design employs a straightforward approach, too. The transistor circuitry is balanced without transformers, and the active stages in each channel are based on high-quality LME49860 operational amplifiers made by National Semiconductor, which offer high gain, very low distortion and a high bandwidth. This means that the ‘sound’ of the Electra comes more from its uniquely laid-out filter curves and less from its balancing and line stages. It’s a good idea to have a glance at the manual before you start tweaking your signals with the Electra! Usually I’m all for a hands-on approach, and generally, I think that analogue audio processors should be like instruments: intuitive to use, with no need for any kind of explanation. It’s not that the Electra is at all un-intuitive, but in this case, my own experience suggests that you can access all the special qualities of this EQ much faster when you already have an idea of what to look for. Thanks to the handy knobs, it’s fun to tweak signals with this EQ, and the fully sweepable controls encourage instinctive and playful filtering, at least on mono signals. Stereo matching would have been easier with rotary switches, but this would also have increased manufacturing costs — and of course wild filter sweeps would also be impossible with discrete steps. Thus, for stereo matching, we have to rely on our ears (which, let’s face it, is not the worst thing to do when working with audio!) or make use of Besides three ribbon connectors there are no cables inside the unit. All connections are made via the traces on the two large PCBs a very modern approach to manufacturing. the not-overly-detailed scales next to the knobs. According to Gregory Scott, early prototypes had no frequency indicators or gain hash marks at all, taking the Clariphonic EQ concept even further: he believes in making you use your ears, rather than have users rely on go-to frequency settings. But, in my view, it was a good idea to provide a little visual guidance on the faceplate here, and, at least for my personal tastes, I feel that it could be a little more precise. Ultimately, of course, Scott is right that EQ decisions should be determined by ear, but adjusting and, in particular, stereo matching channels on the Electra is a little more of a blind flight than I find ideal. However, this criticism should really only be considered a side note. The key criterion on which one must judge any EQ, including this one, remains the sound quality. Not being based on any well-known vintage device, the Electra sounds distinctive, inasmuch as this can be said about an equaliser boasting this much flexibility and these mostly transparent, open-sounding line stages. All bands have been tuned well for their intended applications, and all of them prove rich and powerful under virtually all circumstances. Both the low and high shelving bands offer gentle yet effective control and, thanks to the Baxandall design of the bass band and the equally gentle slope of the high band at its lower frequency settings, they can be combined to act almost as a ‘tilt’ filter, much like vintage EQs such as the Siemens W295b or more modern units made by Tonelux and Elysia. This provides very powerful but unobtrusive control, helping to shape the balance of the programme with broad strokes. By contrast, the proportional-Q mid-bands can deliver more precise, surgical results at higher amplitudes, yet the sound remains stable and somewhat natural, thanks to the special design of their filter curves. All audio stages rely on National Semiconductor’s LME49860 IC, a high-quality audio op-amp. The Electra doesn’t sound as dry as a bone as, say, an API equaliser, but neither does it provide the lush, rich-honey sonic coloration of a discrete Neve. Is it heresy to suggest that Kush’s EQ, rather, combines qualities of the best current EQ plug-ins — their contours, their transparency and their clarity — with truly analogue attributes, such as a powerful grip across the entire frequency range? Don’t get me wrong: this is a fully analogue device and it behaves as such under all circumstances, but it occurs to me that the Electra is a truly modern design, in that it doesn’t even try to emulate any classic EQ topology. Instead, it offers pure frequency-shaping power without anyoverly apparent line-stage coloration getting in the way. And yet, especially in the highs, it still demonstrates all the sonic qualities you’d want from a good analogue EQ, and when you go overboard it never sounds brittle and harsh. In short, the Kush Audio Electra is a flexible, good-sounding EQ with quite a special configuration. The shape and the combination of filter curves may be unusual, but in practice, its well-tuned set of EQ bands give this design many advantages. It’s absolutely evident to me that this a studio processor designed by an audio engineer for audio engineers — and a great EQ with almost countless possible-use cases. Due to the unique layout of the Electra there’s no direct competition. Engineers looking to open up the top end of their mixes should also have a glance at Kush’s own Clariphonic EQ. The Germanium Tone Control by Chandler Limited is similar to the Electra, in that it marries different filter topologies borrowed from several vintage units in a single package. Both the API 5500 and the Tonelux Equalux boast proportional-Q design and four bands per channel. The Bax EQ by Dangerous Music offers fewer control options, but nonetheless shares some similarities, and possible-use cases, with the Electra. I created a number of audio examples to demonstrate more clearly the sound and capability of the Electra. You can find these on the SOS web site. In these examples, I’m gradually improving a pure and rather dry-sounding vocal recording with the Electra EQ. Note how the shelving filters add weight to the signal and open up the top end! A true Minimoog bass-line always sounds good in its raw shape, but that doesn’t mean it can’t be improved! This example shows how the two low bands of the Electra EQ add even more thundering bass. The last pass shows a playful approach with the meaty filter-sweep through the entire midrange. 03. Low proportional Q, low shelf. 04. Low shelf, high proportional Q sweep. Electra excels as a problem solver, too. This sound file shows how the EQ can improve a flat, thin bass-drum signal with, again, quite thundering lows. 02: Low proportional Q, high proportional Q. Precise channel matching can be difficult. The Electra combines no fewer than five EQ bands, and features four different filter topologies. This versatile, well-tuned feature set, combined with a clear and punchy tone, makes for a flexible all-round EQ that excels both at sweetening and problem-solving duties.